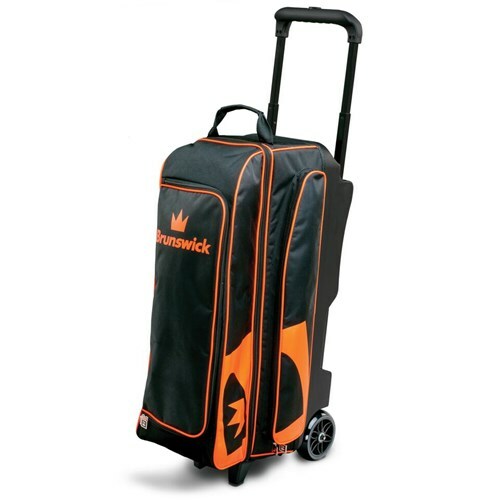 The Brunswick Blitz Triple Roller has the best in class base with flush retractable handle system. This roller offers plenty of storage space for all of your bowling accessories. This roller also features a full length shoe compartment. In the description it advetizes as "with a full length shoe storage on sides". HA! I have size 10.5, there is no way I can fit both shoes in. I can fit one if I bend it. The zippers are sticky and get caught on the edges. For the prize it's not that bad I guess. But bumbed the shoe compartment doesn't work. Shoes fit in the other zipper on top but you loose half of your storage room though. When will this bag be available? This bag will be available around September 7, 2018. Does this bag have dividers or Velcro to hold the balls in place? This bag will have dividers. When will this bag be in stock? We are expecting more Brunswick Blitz bags in stock at the end of this month (March). Due to the time it takes to produce the Brunswick Blitz Triple Roller Black/Orange ball it will ship in immediately. We cannot ship this ball outside the United States.